Max Magician and the LEGEND of the RINGS is a magical tale about young Max, a shy, bullied boy. His life is forever changed when he receives an ancient magical book that opens a mystical door into an enchanted kingdom where an adventure filled with warriors, elves, queens and sorcerers awaits. 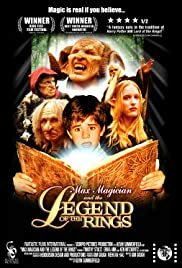 Once the young magician learns that an evil underworld king threatens the beautiful forest realm, Max must summon the courage and knowledge to help them survive. Join him on his magical adventure to a world where people and forests are one, kings and queens still rule, animals talk and mysterious villains haunt the shadows. Follow Max's journey as he transforms from a timid weakling to a skilled warrior and master of sorcery, returning to his own world after saving another with more confidence and wisdom that ever imagined. Lord Dagda: Summon the Redcap! Fetch: Isn't... isn't that a bit excessive? Q: Why is Wyntork such a fool? Q: Why is Max's mom and Belfeebi the same actor? Q: Why is Julie Andrews bald? I went to Wal-Mart and as I usually do purchased some b-movies. This particular one caught my eye because I love fantasy and science fiction. Little did I know that this film would be so painfully bad. The plot centers around a boy who is given a book of magic spells one day from a friend. After receiving this book he enters a magical fairy world filled with elves, trolls and annoying mice that won't stop laughing. In this world the lord of the Unseelee(sp) court is bent on capturing a series of magic rings and conquering the peaceful forest-dwelling seelee of the Bluebell forest. As usual there is a single great champion prophesied to defeat the evil unseelee and save the peaceful Bluebells, yeah that would be Max. It seems nobody in the 'Real world' is played by an actor with any actual acting talent. The characters, especially the main villain, are so annoying that halfway through the movie you'll wish that you were deaf. The king of the bad guys as a matter of fact has this annoying goat-like "bah" that he says like every 3 seconds. And that stupid mouse wont quit laughing. The script is absolutely awful with dialogue that will surely embarrass anyone watching the movie. After all you could never admit to watching Max Magician and retain a shred of dignity. And boy is that main villain dumb. So dumb in fact that his loyal servant Fetch seems to realize from time to time how inept his master truly is. Fetch however does not seem to be smart enough to ditch old goat head form greener pastures. The movies only up-side is that it has excellent make-up work. All the gnarly faces are suitably fantasy-like and do not hide or hinder the actors' eyes or mouths. And Erika Ann who plays Princess Etain is cute as button with her pointy elf ears. This does not save this highly mediocre film however.